Our biggest suggestion prior to starting any remodel, is to contact a reputable remodeler. Search for a local company and check out their reviews, their portfolio, and their BBB rating. Do your homework, time is on your side. Furthermore, find one that fits your niche and one that actually specializes in what you want to do. You want an interior remodel, find a company that specializes in interiors. Looking at an exterior refresh, find a company that specializes in exterior work. We also recommend finding a remodeler that is a one-stop-shop; one that will do both Design and Construction. 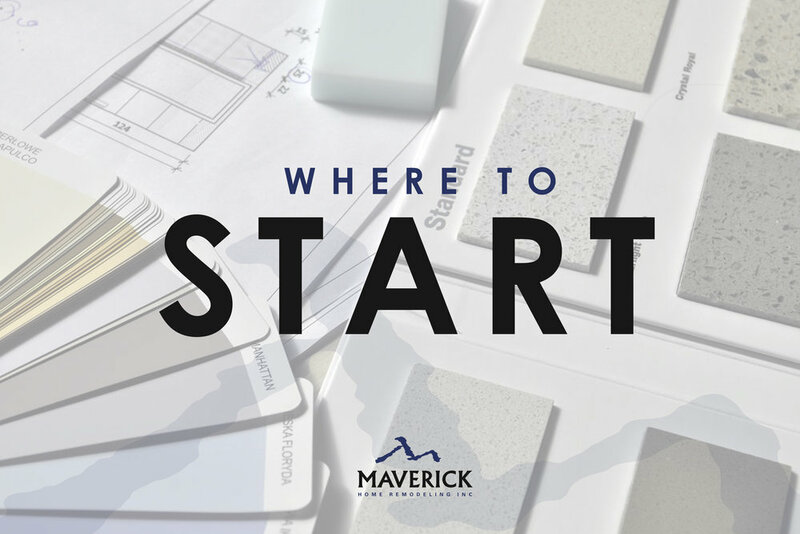 Finding a company like Maverick Home Remodeling Inc., that assists from contact through design to the final product will save you the headache of working with so many different vendors and companies. You’ll work with one entity, instead of multiple entities. This will give you peace of mind, which is a blessing when going through a remodel. Hire a professional. Just like the Conductor of an Orchestra, a Professional Home Remodeler will know the time projects will take, will have the knowledge to do things right, and will surround themselves with a team of like-minded professionals who will get the job done accurately so you walk away with not only a gorgeous space, but a space that is up to code, and safe for you to live in. Know your budget. Do you want to remodel more than one space? Great, do it in stages but do it correctly, so you don’t do things twice. Maverick Home Remodeling Inc. works with our clients to do your remodeling projects correctly so you aren’t breaking into walls, constantly redoing projects you have already done just to revamp another space. We like to think about what things we are doing now that may impact another remodel down the road. Think about your long-term goals as it pertains to your budget. How long will you stay in your home? Is the remodel you are hoping to invest in worth the money you are putting into it? Reputable Professionals will have this honest conversation with you. Like us, they will want to make sure you will see a return of investment. In most cases, rooms with running water, like Kitchens and Bathrooms, have a much higher return of investment than that of a basement remodel. Furthermore, it’s always best to think about the overall purpose of your remodel. Are you a growing family? Are you “aging in place,” which means you may be living in this home through your senior years? Are you planning to sell within the next two years? Questions like these will help to determine the path of your remodel. Our overall thoughts are, take the time to research and find a legitimate Contractor. Ask your friends and family for referrals. Take reviews into account. Visit the BBB to understand a companies rating. Remember to consider your budget and have open and honest conversations about your return of investment. But most importantly, enjoy the ride, and go into renewing your space knowing your investment is worth every penny! Older PostRenew Your Home! Renew Your Life!